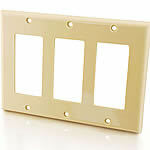 This F-pin cable-tv-cable faceplate allows you to add your own cable outlets in your home or office. A coupler included for easy installation. This F-pin cable-tv-cable faceplate allows you to add your own cable outlets in your home or office. 2 coupler couplers included for easy installation. Feedhrough insert with fype coupler for a professional finish to your installation! Use for home theater, multimedia classrooms, and conference rooms for your audio/video applications. Run your cable system through your walls and make your connections cleanly without the mess and clutter of external cabling. 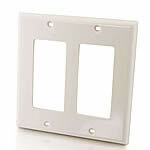 Mount this insert in a standard electrical box or mud ring, and finish with a standard decorative wall plate. This multimedia insert is made from high-impact plastic, and is colored to match the room decor. Plus, it provides a stylish and practical way to connect your home theater system. 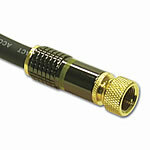 The fype connector is a simple female coupler. Rugged construction ensures years of trouble-free use. This multimedia insert fits standard Leviton Decora® wall plates for a stylish design that allows for seamless integration into home or office decor. This insert is stamped from 20 gauge steel and painted to match your room decor. Use it in standard electrical boxes or mud rings, and with standard decorative wall plates for easy installation. 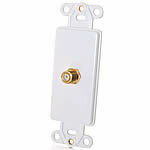 An fype connector jack on the front and back make this wall plate simple to install and use. 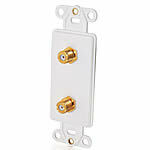 The wall plate fits standard NEMA wallboxes and openings, and mounts to any electrical or surface mount box. 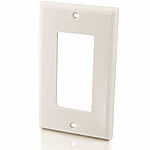 Compatible with Leviton Decora® Brand and Leviton Decora® Brand compatible switches, wall plates, receptacles, inserts and GFCI receptacles. 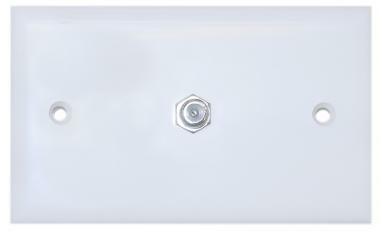 Use this wall plate with multimedia inserts, networking and audio/video applications. 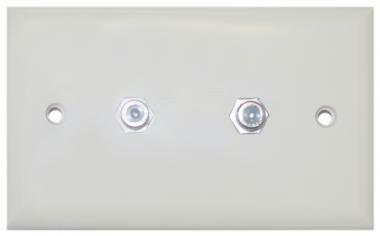 Snap-in modules can be mixed and matched to configure a custom wall plate solution. Agile Modulator accepts Audio/Video input from any source and modulates the signal to a CATV/UHF channel of your choosing. Watch your DVD player, satellite receiver, or CCTV surveillance camera on any television in your home. Imagine flipping to a channel on your TV and being able to see who is at your front door or finish watching a DVD movie you started in a different room.